Huka Falls mark the spot where the longest river in NZ, the Waikato is slammed with full force into a narrow chasm, which makes a dramatic 10m drop into a surging pool. The sound of the water from these falls is so powerful! 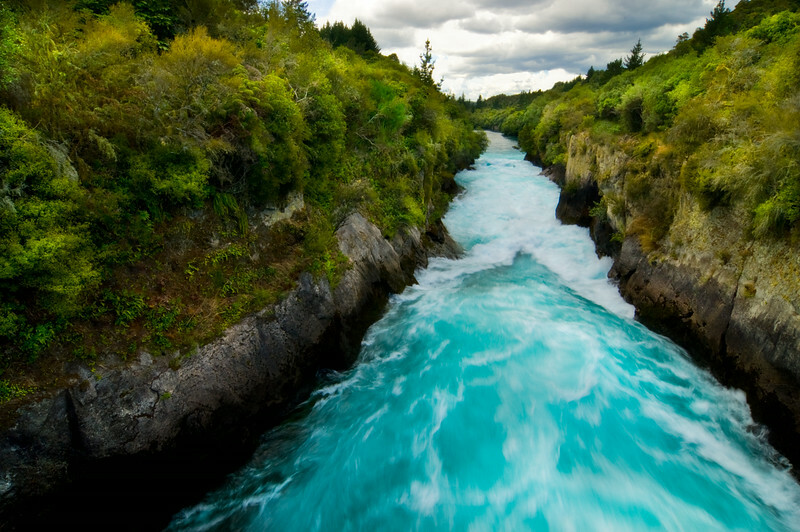 the waikato drains into Lake Taupo, With a surface area of 616 square kilometres (238 sq mi), it is the largest lake by surface area in New Zealand, and the second largest freshwater lake by surface area in geopolitical Oceania after Lake Murray (Papua New Guinea). Lake Taupo has a perimeter of approximately 193 kilometres, a deepest point of 186 metres. It is drained by the Waikato River (New Zealand's longest river), while its main tributaries are the Waitahanui River, the Tongariro River, and the Tauranga Taupo River. It is a noted trout fishery with stocks of introduced brown trout and rainbow trout.